I was reading an article in Parenting magazine while waiting to go into my daughter’s annual checkup yesterday. She will be 9 years old soon and it seems like her attitudes and moods change every day, if not every hour! According to this article, “Mind Reader – Your Child’s Blossoming Brain, Age by Age: a Road Map of the Awesome (and Aggravating) Changes” by Holly Pevzner (February 2013), I’m not off the mark. It seems our kids’ brains are in super active mode. According to Marcy Guddemi, Ph.D., executive director of the Gesell Institute of Child Development research, education, and advocacy center in Connecticut, “There’s a clear path that all children’s brains take, but each child has his or her own rate.” And it turns out that all kid’s brains must follow this path and cannot skip ahead. This is the age when kids want to please. They want to help out, even when you don’t want them to. That’s because at 5, kids become aware that what they do effects others around them. They start to understand that sharing makes people happy, that if they help clean up the playroom Mommy will be happy, and that if they give Grandma enough hugs she will be happy. 5 year olds learn that pleasing others feels good, because they get praised and feel acceptance. That’s why your 5 year old may annoy you to no end to help rake the leaves when all he does is make a bigger mess. So try to remember that his evolving brain, namely the prefrontal cortex where self-awareness and decision-making happens, is the reason. Praise big bro for making little bro feel good. Encourage this positive change by letting him know he is being good and also telling him that by being good, he is making others feel good too. 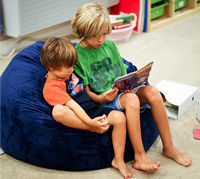 The next time big brother Tommy is sharing his bean bag chair and reading to little brother Ethan, tell him “I love it when you play together so nicely, and I know for sure Ethan loves it too!”. Before this milestone, kids don’t really get it that other people don’t feel the same way they do. It’s really all about their emotions up until now. Yes, at 5, they like to please, but they do it to get their own emotional satisfaction. Whereas at 6 years old, they understand others have feelings as well. This is because the brain’s frontal lobes are really developing now. This is where emotions and judgment are processed. The world really opens up to kids beyond their own reality at this age. Encourage him to empathize and praise him when he sees someone else’s perspective. It’s interesting to note that it’s also at age 6 when music can have a big impact on how the brain forms. Music actually helps kids learn to empathize! According to a study in Psychological Science, only 20 days of music lessons will improve a 6 year old child’s language and social skills. So get them signed up for whatever instrument they show interest in (and cross your fingers it’s not the drums or electric guitar). What have been your experiences with these ages? Stay tuned for Part 2: how does the brain change in 7-8 year olds!